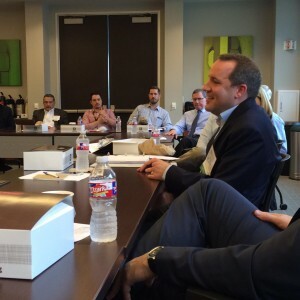 On February 10, the PESA Emerging Leaders Committee hosted its bi-monthly leadership forum with PESA Advisory Board Member Matt Armstrong, Director, Government Relations at Baker Hughes. Member company high performers engaged in an open dialogue with Armstrong, as he shared insights on the direction that the new White House and Congress could take on critical issues. Armstrong addressed the underlying change in momentum on oil and natural gas industry issues that accompanies the new political landscape in Washington. He discussed the potential for political realignment in the Rust Belt, and what Trump’s blue collar constituency could mean for the Republican agenda. Armstrong also noted strong, continuing gains for Republicans in state legislature. These gains may converge with Republican policy objectives in Congress, resulting in a shift in regulatory authority to the states. While broadly favorable, this shift may feed into the current trend of intense “localization” of anti-oil and gas political activity. While progress has already been made on some of the industry’s key issues, much more—and harder—work remains. Broader political issues, foreign policy and other external factors cloud an already complicated picture. As complexity and volatility increasingly define the political agenda, the importance of inter-association dialogue and cooperation increases. Service and supply companies share many issues in common with their customers and rely on the health of the overall oil and gas industry for success and should support individuals and associations who are stewards of their shared goals and issues. Armstrong specifically encouraged smaller companies without a presence in DC to join trade associations like PESA to advocate on their behalf. The Washington DC Fly-In, which is an opportunity for PESA members to directly connect with policy makers to advocate on behalf of the service and supply sector, will be held February 26-28.